Yesterday we took a day trip to the mainland and got to spend some time visiting some birding sites I've been wanting to visit for a few weeks. I had been slow in adding any species to my year list on the island this week, with the lowly rock pigeon (67) being my only addition. I knew some off-island bird-watching would help me reach my goal of reaching 100 species before the end of the month, and I started off on the ferry ride adding rhinoceros auklet (68) and common murre (69). Then driving along Highway 20 I added a rough-legged hawk (70). 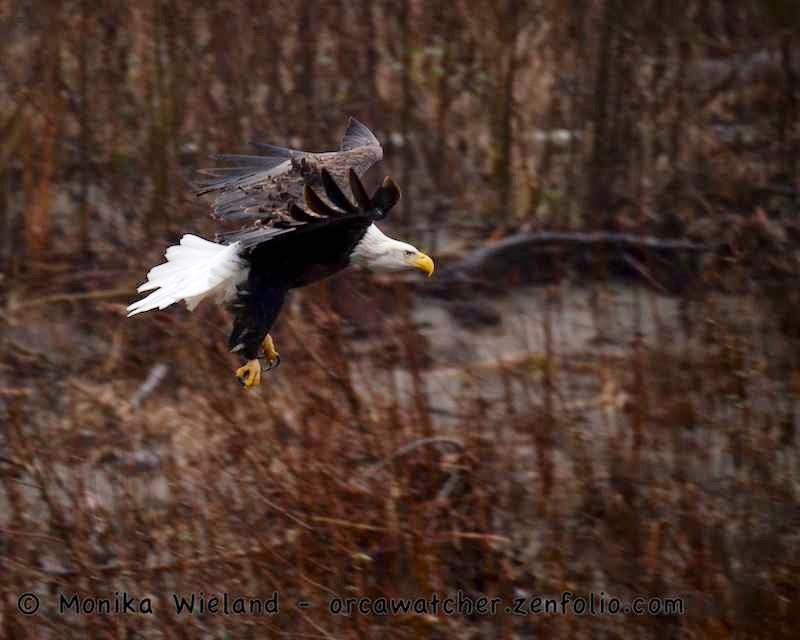 Our first birding destination was along the Nooksack River near Deming, Washington. Several friends have taken phenomenal photos at the Mosquito Lake Road Bridge, so that's where I wanted to go. I heard eagles right when I stepped out of the car, but my first focus was on all the other bird around: black-capped chickadees (71), a pair of American dippers (72), Steller's jays (73), and American crows (74). Okay, now on to the eagles! Every so often an eagle would decide to change positions, at times giving us a nice flyby on the bridge, and then causing some commotion as the ranks got reshuffled at the new perching site. 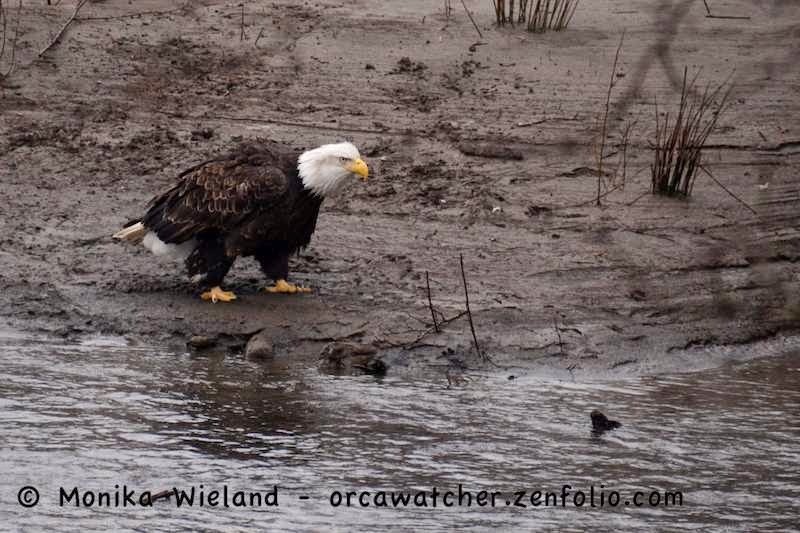 He/she proceeded to walk along the shoreline (I don't think I've ever seen an eagle walk before - it's more of a swagger! 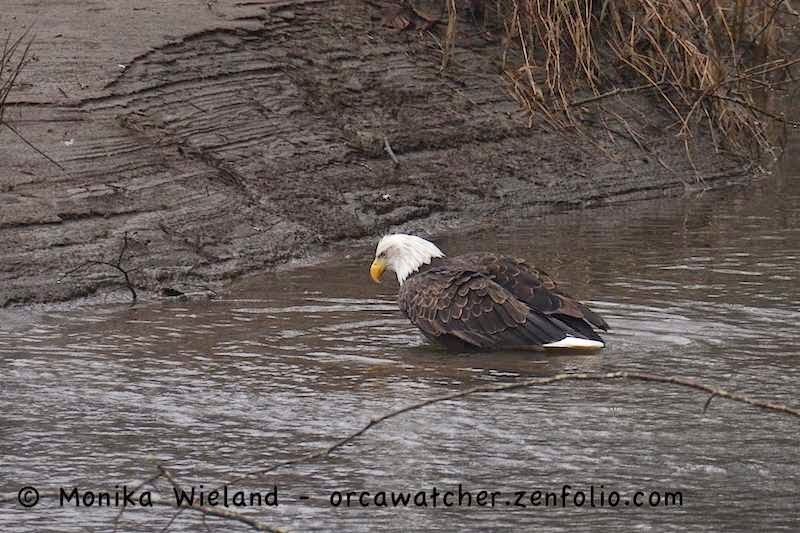 ), then wade out into the shallows, presumably looking for a fish carcass. 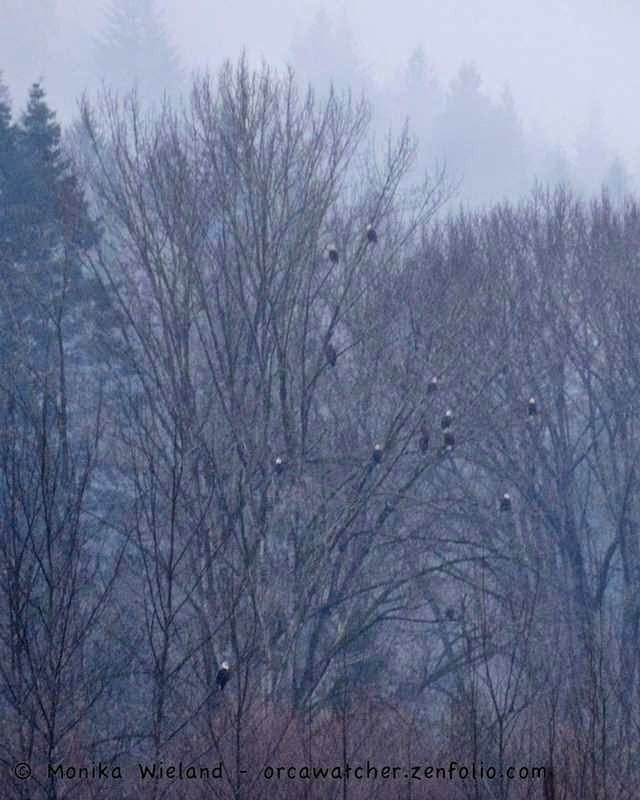 We spent about an hour watching the eagles until heading to our next stop down in Stanwood, WA. Of course I was birding from the car along the way and added Eurasian collared-dove (75), American kestrel (76), and Brewer's blackbird (77). 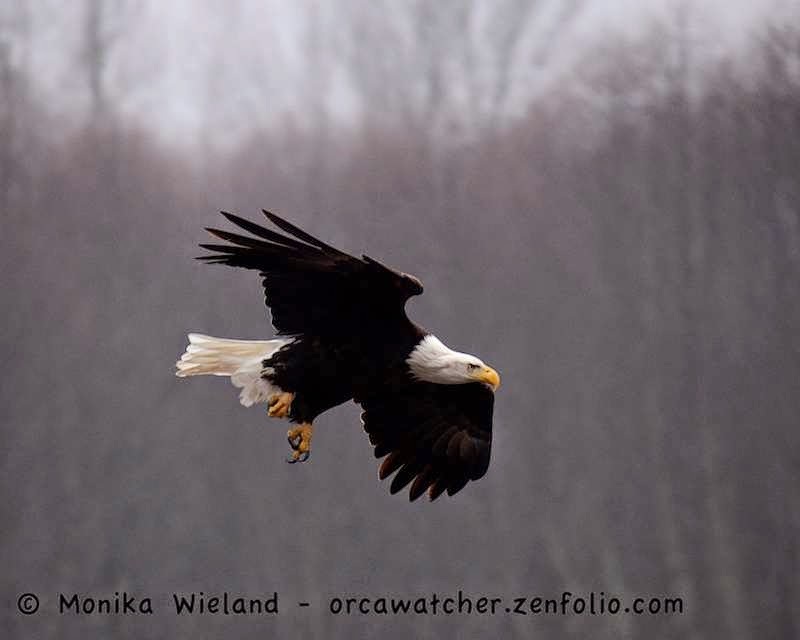 Also many more eagles, easily putting our tally for the day at over 100 birds! There have been lots of fantastic reports coming from Eide Road in the last few weeks, and despite the weather being misty and foggy I was hopeful when we parked and I could see several people with cameras set up on tripods nearby. Sure enough, my most hoped-for bird of the day was not only there but perched right out in the open - a long-eared owl! Not only year bird #78, but North American life bird #362! 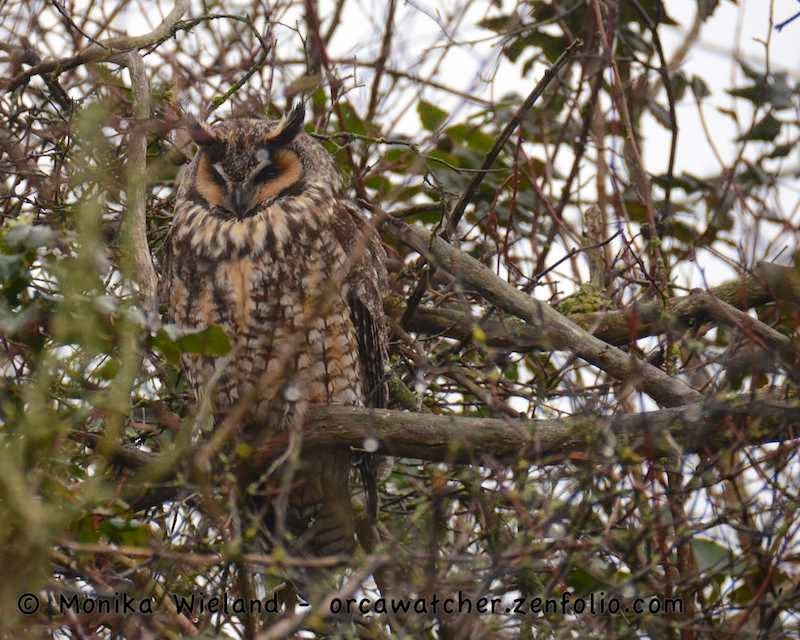 Long-eared owls are widespread across most of the country but are considered rare west of the Cascades. 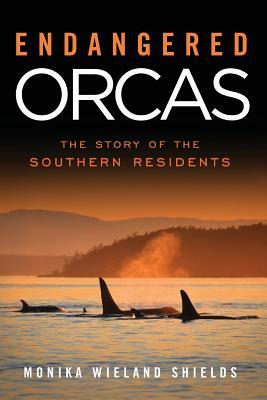 Even where they are found, they're in small numbers and sightings are sporadic. They're nocturnal hunters that roost during the day in dense thickets, often buried so far in the bush they're highly camouflaged. 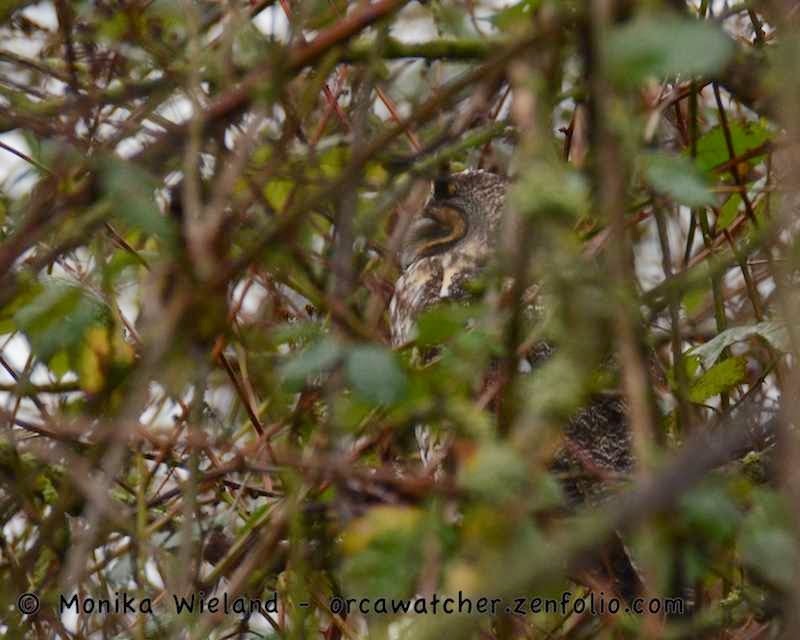 There was actually a second owl just a few yards away, and if someone hadn't pointed it out to us, I'm pretty sure I would have missed it, even if I had been looking hard for it - even after he pointed right to it, it took me a minute to see it! Find the owl! No wonder they're so uncommonly seen...I wonder how many I've walked right by in my time? I'm amazed at how approachable some birds are. 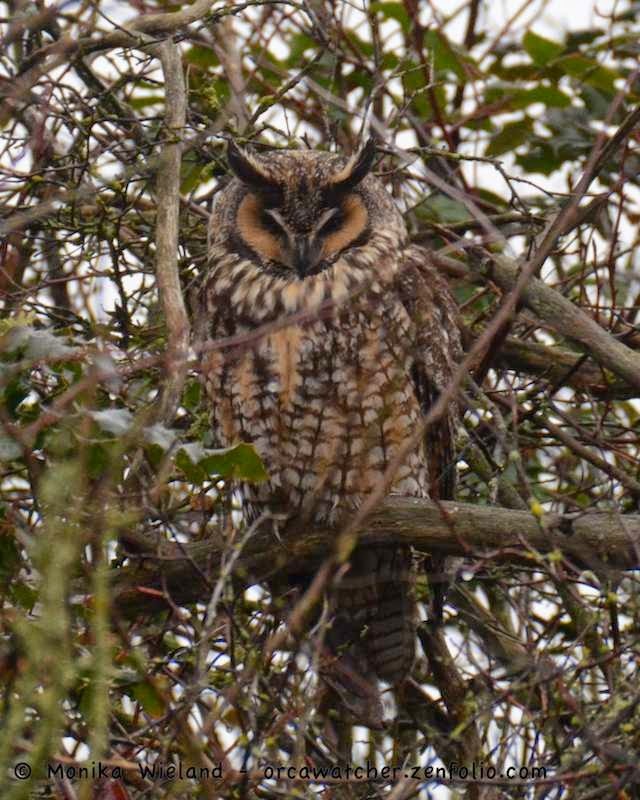 The first long-eared owl was perched right beside the trail, no more than 10 yards away from where the people were, yet he could barely be bothered to open his eyes to glance at us as we ogled him (I'm assuming this was the male - someone else there said it was a pair and the one in the bush was the slightly larger female). While enjoying the owl I heard an Anna's hummingbird (79), then when we walked further down the road we saw two short-eared owls (80) - another bird I love to see, but these guys weren't nearly as cooperative for photographs. By this time we had to go run some errands, but I made a detour through Fir Island where a flock of snow geese (81) flew overhead, just as I hoped they would. The birding day ended when we stopped to eat a late lunch at Bay View State Park on our way back to the ferry, where greater scaup (82) were in view along with some loons, common goldeneye, and great blue herons. There were rafts of thousands of other ducks on the in the bay, but they were too far away in the dimming light to identify. I thought adding 15 species was pretty good on the day, but it's only helped me keep pace with Dave (84) and Dad (79). It's been a pretty dreary start to 2015 here in the San Juans, but with some sunshine forecast in the coming week maybe I'll get out to do a little more birding on the home front. Sounds like a super trip. Congratulations on seeing the owl. I am glad you took the time to go off island.